Picture this. It’s 8:30 in the morning yesterday in Phoenix, New York. 28 degrees. And our sales representative David Rooker is standing on the edge of the John C Birdlebough High School baseball field with the groundskeeper for the Phoenix NY Central School District. What they saw - a baseball field partially covered with ice, soaking wet and muddy with big puddles of water. Oh, and there was a game scheduled yesterday at 3pm. 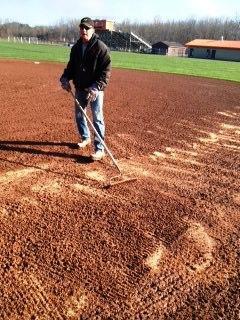 David and the groundskeeper applied one bag of EP Minerals' Play Ball! Conditioner on the first base side of the infield. They waited five minutes to see what would happen. The result? Dry enough to play! David worked with the groundskeeper to get him enough Play Ball! 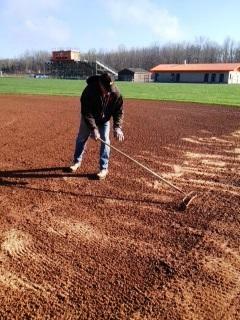 to do the infield and get it ready by game time. Bottom line? The Phoenix Firebirds from John C Birdlebough High were ready to take the field at 3 yesterday. Game on. Go Phoenix Firebirds! Reducing compaction. Provides permanent porosity. Play Ball! is extremely stable and resists crushing underfoot so it won't turn to dust or mud. Play Ball! handles the toughest infield duty and lasts for many years.